Mrs. Miner's Kindergarten Monkey Business: Chapter One of Guided Reading Book Study! Grab a FREEBIE for your Readers' Notebooks! Chapter One of Guided Reading Book Study! Grab a FREEBIE for your Readers' Notebooks! Once again, I am elated to be involved with this amazing group of teachers, bloggers, professional developers and, most of all, friends. We at Freebielicious all have the same philosophy when it comes to teaching and blogging: we present ideas, freebies and discussions based around the best interest of children and involve others in the educational realm who have the same idea. This time, I'd like to tell you about a professional development opportunity for PreK to 1 educators. We are reading this book and attacking it from a primary level perspective. Please join us by reading along, commenting, and, of course, grabbing Freebielicious Freebies along the way! I am looping to first grade! I had THE BEST class EVER this year. As I've told everyone, I always love all of my students individually, but, sometimes the mix and dynamics of the class together just doesn't jive (gasp...I know.). After 175 days together, it is often best for us all to have a new opportunity and visit in years to come. This year, there was something different in my class that I can honestly say I have never had before. It is just a great mixture of love, laughter, learning and balancing each other out! Knowing that we had a bulging-at-the-seams kinder class this year, I went to my principal and said I would be more than willing to loop with this group and he agreed that it would be a possibility. The hardest part for me was keeping my excitement to myself as I had kids breaking down thinking they were moving onto a new teacher, parents worried about how their child would adjust in a new class, etc. Well, now, there are some adjustments to be made within my blogging business. Kindergarten teachers, have no fear, I won't be dusting you...my expertise continues to lie in the area of 5 and 6 year olds and that is what I can speak to. My shift to working in a first grade classroom will consist of building on what I know and seeking assistance and ideas from my 1st grade teacher fans. If you have followed me, you know that I am huge on teaching to the needs of individual children, so the work I share with you will continue to fit the needs of a range of learners as it has in the past. So, bear with me as I take on this new adventure be ready to share your best advice and hints as well! Chapter one, Preparing for Guided Reading, in The Next Step in Guided Reading was chocked full of information. My friends Crystal at Kreative in Kindergarten and Tammy at Live, Love, Laugh are hosting this chapter and have done a fantastic job in dissecting it (click below to check out their posts), so I am going to focus the part I know best which is Independent Literacy Activities (aka Reading Workshop, center time, etc.) because I LOVE the way it works in my classroom and want to share that with you. I am hoping to gather information from the other bloggers, particularly about Reading Notebooks (anyone with experience with these, please comment below!). board and the materials I use to do it. It took me years, but I finally found the perfect (not to mention easiest) way to manage Independent Learning Activities in kindergarten (and am rejoicing in the fact that it will work even smoother with first graders who have ALREADY learned this process). 1)Start slow. As you can see my board above only has a few choices. This picture was taken at the beginning of the year. I introduce independent centers (what I call Basket Work a.k.a. must dos) whole group, then let the students explore with a few different choice centers afterwards. I keep going with this process until all major/staple Basket Work activities and choice work has been introduced and then I can begin TRUE Reading Workshop. 2) Limit the must dos and provide choice. Making students do lots of recording and passing work in during Reading Workshop makes more work/managing for you and takes the excitement and engagement out of the learning during this time. If all of the choices are educational, purposeful and meaningful, why does it matter what they are actually engaged in? I am even planning on taking the one Basket Work/must do away as the year goes on next year if my kiddos (who LOOOVVVVEEE it) allow! 3)Make Choices Meaningful, Engaging, and Effective (and part of the curriculum). One mistake (well, in my eyes) I see teachers do is planning, gathering, manufacturing new centers week after week. Use what is already a part of your classroom and the students will automatically differentiate to their level. An example is reading the room: students may start by just "reading" the alphabet chart, but as time goes on, they will be reading charts, signs and more. Keep the centers the same, just change the goals. An example would be writing the room...if your phonics focus is digraphs, have them find 10 words somewhere in the room or books with the particular digraph you are working on! Work smarter, not harder because Lord knows we already work hard enough! Look at this perfect little picture of these 3 girls writing up a storm in the writing center. (Side note: I love my organizational drawer that was new this year...it keeps the center neat and organized. Not sure why I hadn't thought of it before. Writing center can easily be tweaked for whatever type of writing is expected there during "choice literacy centers". 4) Create STAPLE centers: If you are a longtime reader of mine, you have heard me use this term frequently. This is what builds your independent learners quickly and effectively. You have STAPLE types of work where the activity stays basically the same, but the goals change. That way, your students already know the expectations of the center (stamping, I Spying, Pokey Pinning, Directed Drawing, Magazine Hunting, Writing the Room, etc...) but the material is easily changed out on a regular basis. Click on this picture for more detailed information about these staple centers! Readers' Notebooks are going to be new to me this year and I am thrilled about it. 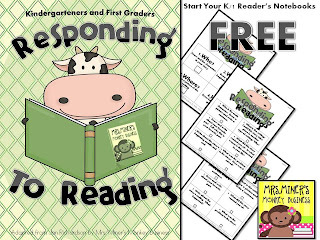 Click here to go grab the freebie I created for easy to manage, independent reading responses! They are differentiated to start with kinders and move up as they advance! One more thing, I am SUPER, EXCITED about is the newest center I created to "amp" up my Pokey Pinning Literacy Center! 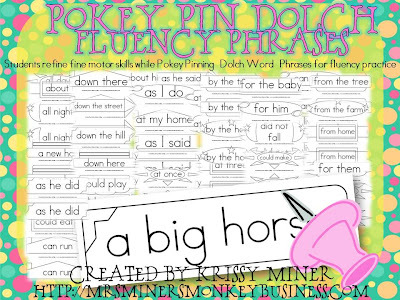 I created Dolch Fluency Phrases for my students to poke at! There is no way my little friends would let me stop doing Pokey Pins and, let's face it, even firsties still need to strengthen their fine motor skills! The Reading Notebooks has come up a few times as I hopped around to see everyone's posts! I'm also moving from K to First next year and have been toying with the idea of some sort of reading notebook for a while but it would have been tricky in K. I think with the move to First now is the time to try it! - Papers from responding to Read to Self (thinking of students doing this one day a week like Jan suggested in book). Hi Krissy! I am new to the blogging world and I stumbled across your blog and I was so excited to see that you are doing a book study on "The Next Step in Guided Reading"! We have been using this book at my school for 2 years now and we absolutely love it! Jan Richardson did a wonderful job writing and organizing the book, it is so easy to read and follow. I went ahead and tabbed and labeled certain pages that I refer to often. I also copied them and put them in sleeves inside my guided reading plan book that way in case I forget to bring my book home, I still have the important pages I refer to for planning. I loved your suggestions for literacy centers. That is something I am wanting to improve for next year and your post really helped me get some ideas. Thank you! OMG! You are soooo lucky to be looping. Will you move back to K after this opportunity? Do you have a preference b/w K/1? I've been a follower of yours for quite awhile and love your blog/ideas/suggestions/materials, etc. When I found out I was looping with my class up to first (then on to 2nd) I was sad that I would have to find first grade blogs to replace my favorite K blogs! NOW, I'm so happy that you are looping and I can still be a devote Monkey Business follower!! YEA!!! Thank you for your insight on the first chapter of the Guided Reading book study. I look forward to implementing your great ideas. So excited for you that you are looping. I just completed my first year in 1st grade. It was a good learning year. Thanks for this post. I'm trying to get things revamped for my literacy centers, etc. This will help me. Look forward to the coming posts as you move into 1st grade. We would like you to see a book that we are intertwining with the GR Book study. We are also looking for some insight on Ch. 2; we included some of our questions/comments. I love this idea. I was just thinking of something similar for 2nd graders. 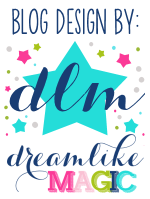 Kim Oldenburgh told me about your blog. Glad I found you!